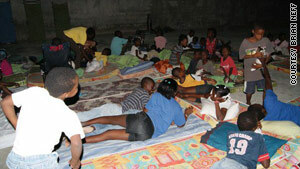 The Maison De Lumiere Orphanage was serving as a makeshift triage center. Mission Viejo, California (CNN) -- When Marty Kubicki received a text message that his wife, Aahmes, and two teenage daughters, Olivia and Alexis, were alive in Haiti, he was overwhelmed with relief. "I felt like an enormous burden had been placed off me, but at the same time I knew that they were OK. I always felt they made it," he said. Groups of church members have been volunteering at an orphanage for nearly six years, since church members Bill Manassero, his wife Suzette, and Jim Duggan opened the center. But by Friday there was chaos at the Maison De Lumiere Orphanage in Haiti as 11 American missionary volunteers were trying to find a way to leave after severe shortages of food, water and medicine sparked anger in people they had been trying to help. "People are becoming hostile at the missionary workers and we now find ourselves desperately trying to get them out," said Mike Maiolo, senior pastor of the volunteers' home church in Mission Viejo. He said he had received urgent messages from Haiti that everyone wanted to leave. The Kubickis and the others from Mission Viejo Christian Church arrived in Port-Au-Prince a week ago to help assist nearly 100 abused and abandoned children at the orphanage. The facility sustained heavy damage in the earthquake but no one was killed, he said. Within hours of the quake, the volunteers became de facto nursing assistants after word spread that Maison De Lumiere was serving as a makeshift triage center. "Lots of doctors and nurses have been coming by the facility because word's gotten out, so there's all these people being pulled out of rubble and they're assisting and attending to the injured as best as they can," Marty Kubicki said. Judy Beltis left her husband, six daughters and five grandchildren in California when she came to Haiti on January 8. Moments after the walls and shelves around her collapsed, she found herself attending the injured and working to save lives, said her husband, Paul. "This is a mom who couldn't put a Band-Aid on her kids when they had a cut finger because she was so squeamish, and now she's dealing with whatever needs to be done," he said. On Thursday, the family was assured that Judy Beltis was safe and protected. "I'm going to urge her at some point to come back and get a little rest and restoration, but I know she'll want to head right back," said daughter Jaime. But that was before Maiolo received the urgent messages late Thursday. He said the situation had deteriorated to the extent that no one felt safe going outside the compound. Contact with his missionary members in Haiti has been limited to occasional text messages, Internet streaming and e-mail, he said, and his volunteers have not been able to reach U.S. State Department officials. "The world around us is in such need when something like this happens and we've got to be there for them, but at the same time, there must be a quick way to get them out when there is nothing more to give," Maiolo said.